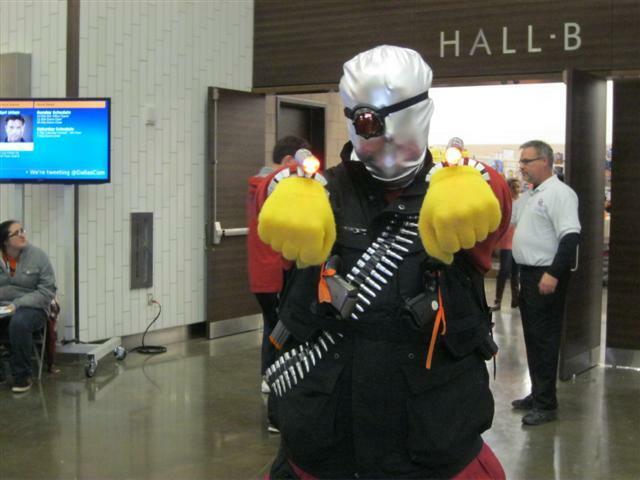 Dallas Sci-Fi Expo was a bit more of an ordeal than it should have been this year. At least, Saturday was. I am not sure this could have been avoided given their usual venue of the Irving Convention Center. It is a nice building but one that was built more for business conferences than sci-fi conventions filled with tens of thousands of cosplayers and collectors. Couple that with Dallas Comic Con's amazing ability to procure celebrity guests who don't usually come out to Texas and this can cause problems in regards to parking, lines, and crowds as every geek in the area (and more than a few from out of it) rush like so many Zerg upon Las Colinas. Case in point. There were two guests who were only scheduled to be there on Saturday - Stephen Amell (most famous for playing Oliver Queen on Arrow) and Karen Gillan (most famous for playing Amy Pond on Doctor Who). I know for a fact this was Karen Gillan's first appearance at a convention outside of New York and San Diego. 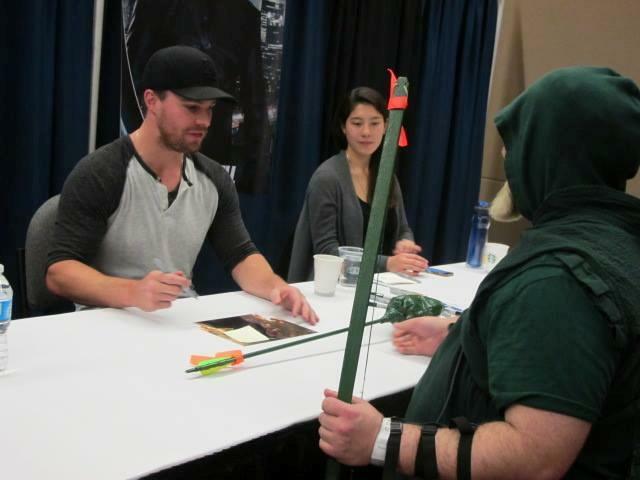 I suspect it was one of Amell's first trips to an inland American comic con as well. As such, there was a lot of demand for autographs and photo opportunities with them. And as such, there were some insanely long lines for them. How long? 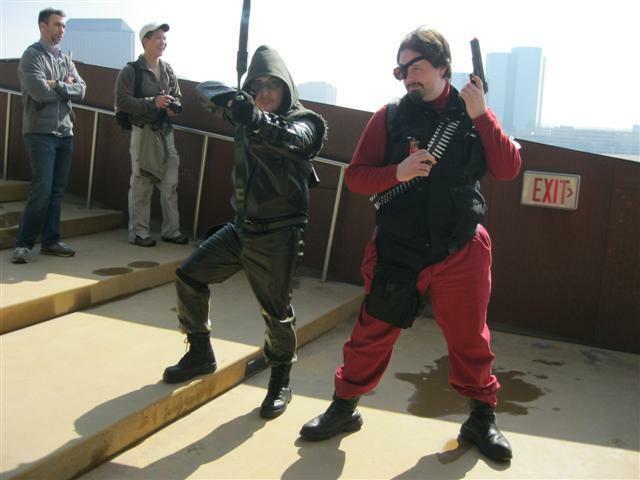 It took me and my pal Jeremy (seen below in his classic Deadshot costume) the better part of four hours to meet Stephen Amell. This was not, it should be noted, all in one line. We started out waiting in line for Stephen Amell at 11:30. Around noon, word came that Stephen was taking his lunch break and that he would be doing photos with his fans from 1 to 2. Deciding we didn't like the idea of sitting around for two hours just to keep our place in line - and deciding a photo with the man would be as good as an autograph - we decided to head to the third floor, where the photo-ops were being sold. By that time, most of the third floor had been consumed by a line of people waiting to buy tickets for photo ops. I heard complaints from people ahead of us directed at the Con staff about how they had been made to wait in line for nearly two hours (they were trying to get photo ops for Karen Gillan at 5:30 that evening) and how there was no point in making them wait in line when they were letting people who wanted tickets for the most immediate celebrity guests cut ahead. In the case of Stephen Amell, this didn't help matters. Jeremy and I wind up waiting in line to buy a photo with Stephen Amell until about 1:45 pm - 45 minutes after the Stephen Amell photo-shoot started! Then we were informed that they had too many people and we couldn't get a photo-op. So we went back upstairs and got back in line for an autograph, where we waited for about another hour. And yet, it was worth it in the end. Because this happened. 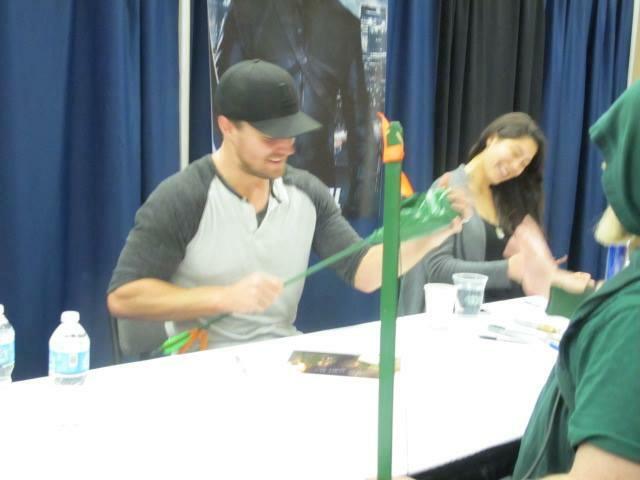 Yes, I made Stephen Amell a boxing glove arrow. And he loved it! Looks a bit like a kid on Christmas morning, doesn't he? This left myself and Jeremy with much less time than we'd planned to hit the rest of our respective "things to do" list and even less time for wandering about and taking picture of the various cosplayers. Still, we did get some time to do that. I was behind this gentlemen while waiting in line. 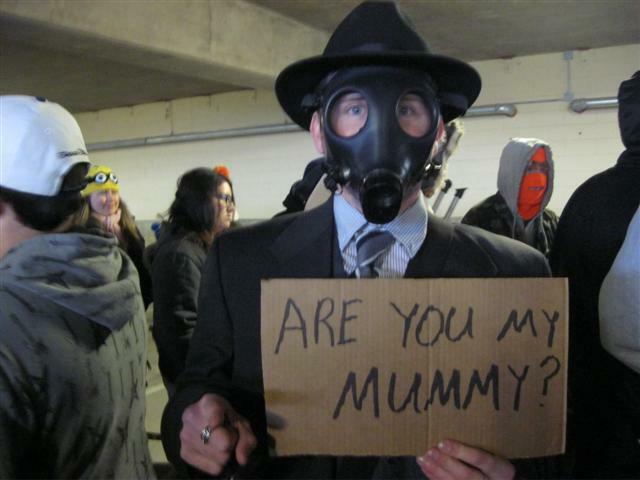 During that time, three people asked him if he was meant to be Wesley Dodds - a question that confused him. It turned out he was a dapper victim of The Empty Child from Doctor Who and not, as you might guess, the Golden Age Sandman. 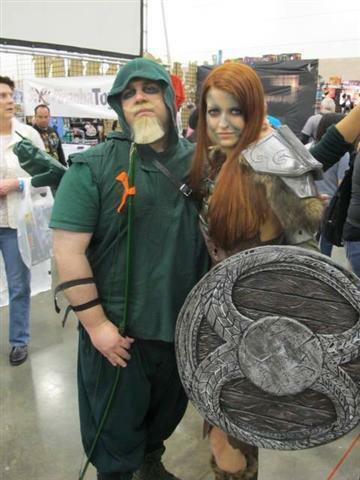 The Longbow Hunter and Aela The Huntress from Skyrim. It is he! 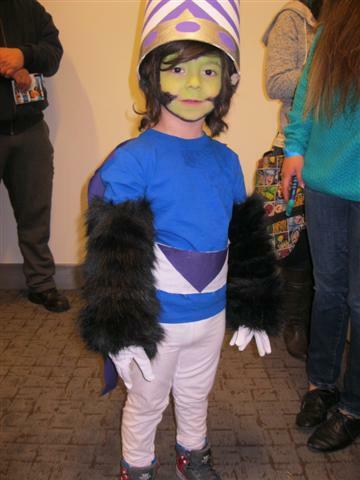 The mad monkey, mad in this case meaning crazy and not angry, though he too is angry, who lives to make life miserable for the accursed Powerpuff Girls...MO-JO JOJO! 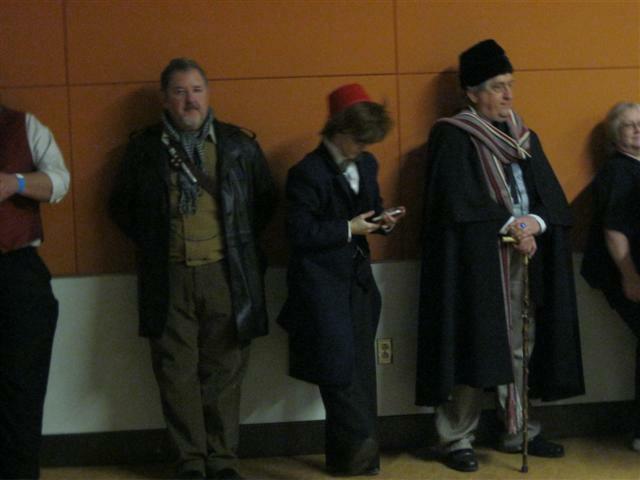 The War Doctor, The Eleventh Doctor and The First Doctor from Doctor Who. I call this shot "A Princess And Her Scoundrel". That's Marla of MCubed Cosplay with her boyfriend David. 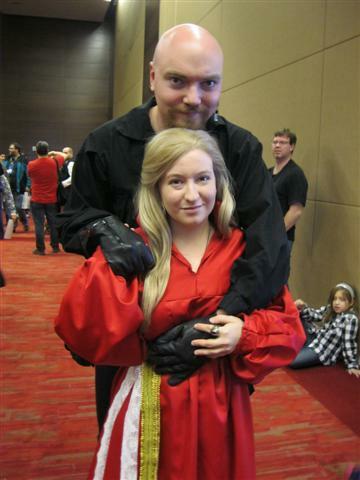 My friends Wade and Sarah as Westley and Buttercup from The Princess Bride.